Our range of Commercial Doorsets suit many commercial applications from doors for hotels and residential homes, to student accommodation – as well as schools, offices and retail. Whatever the situation we have a doorset to suit. In addition heavy duty door and frame protection against abuse and physical damage can be added to ensure long term service life. Care homes require doors to meet fire and mobility requirements and often extra wide doors for ease of access for wheel chair users. This standard is a requirement for all NHS buildings and ensures a high level of construction and manufacturing to suit the required application. 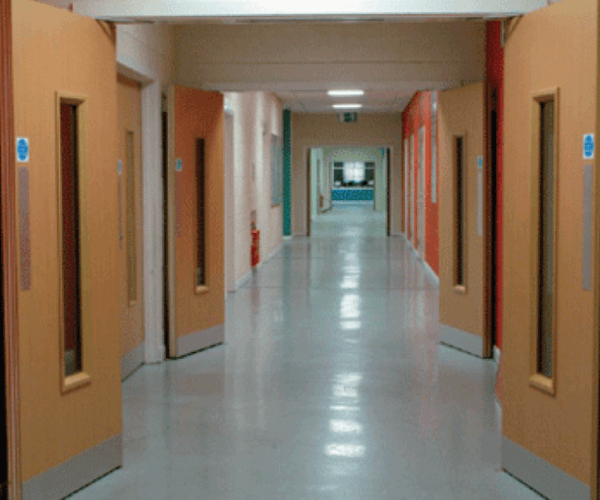 With many different applications, requiring a variety of performance characteristics and levels, SWEDOOR can offer a doorset to suit each requirement. Varying from general duty to high performance acoustic and fire resistance, offices and other applications such as studios, media centre, administration facilities, communication centres, as well as transport, entertainment and leisure facilities and many more applications, all have specialist requirements. Veneered doors are ideal as they are available in many veneers to suit any décor. Whilst we have a standard range of veneers, special veneer species as well as re-constituted natural veneer with matching or contrasting hardwood edge lippings are also available. Door frame supplied pre-machined and fitted with hinges and strike plate, head pre-drilled to accept screws and ready to assemble. Pre-fitted in accurately machined recesses, ready for bolt-through handles. All glass apertures fully glazed with appropriate specification components. Hinges pre-fitted, ready for hanging. Optional fixed pin hinges available. Every door leaf is manufactured with stiles and rails. The outer edge of the door can be hardwood, PVC or edge banded, depending on door type. FD30 or FD60 certified fire doors. Fire doors are also certified for smoke control (FD30S, FD60S). A range of Doorsets have been tested to the relevant clauses of DD171 resulting in a severe duty rating. For ease of visibility through the door, DDA compliant vision panels available. For ease of access, particularly for wheelchairs, doors are available in DDA compliant sizes. For ease of operation, ironmongery positions can be DDA compliant. For the visually impaired, a wide range of colours and contrasts can be offered. Approved Doc M suggests a LRV difference of 30 points or more between adjacent critical surfaces.